Sitting at the Tim Horton’s by the river here in Huntsville, closing in on 1 p.m., I’m watching the lunch crowd go in and out, when a local looks out the window and starts guffawing. We turn and look out the window. And, sure enough, hanging from the poor old lady’s front bumper is an ex-partridge. Finally, the driver, an elderly lady, leaves the car to inspect the damage, and then comes into the Tim Horton’s to get some paper towels and a bag to dispose of the thing. She’s dignified, but is lighthearted about the incident. Probably the best way to handle this sort of instant celebrity. The elderly lady, on the other hand, physically removed the smooshed partridge, wrapped it up in a bag and brought it to the back of Tim’s, where it could be properly disposed of in the dumpster. And that was the highlight of the lunch hour. After a busy quarter working on a couple of big non-fiction projects, I booked this day to myself to go into Toronto and ride the Northlander train up to Huntsville and recharge my creative batteries. Of all the passenger railways that operate in and out of Toronto, the Ontario Northland was the one route I hadn’t taken. I picked Huntsville as a destination because it left me about four hours to explore the town, which was a decent size, looked beautiful, and had all of the amenities of civilization, including a bookstore and a Tim Horton’s. The Northlander departed on time. It didn’t have the amenities I was used to, with no plugs in the seats nor tray tables. It did have marvellous legroom, however, with seats well arranged to their own windows. I was also told that power outlets and free wi-fi were available in the snack car at the back of the train. The ride out was indeed beautiful. We left Toronto under clear skies and proceeded up the Don Valley, which still had a lot of its colour. The trip was uneventful, though we were stuck for forty-five minutes outside of Washago due to a foreman on the line who “wouldn’t answer his cellphone”. Despite that delay, the train strived to make up time, and were only thirty minutes late arriving in Huntsville. 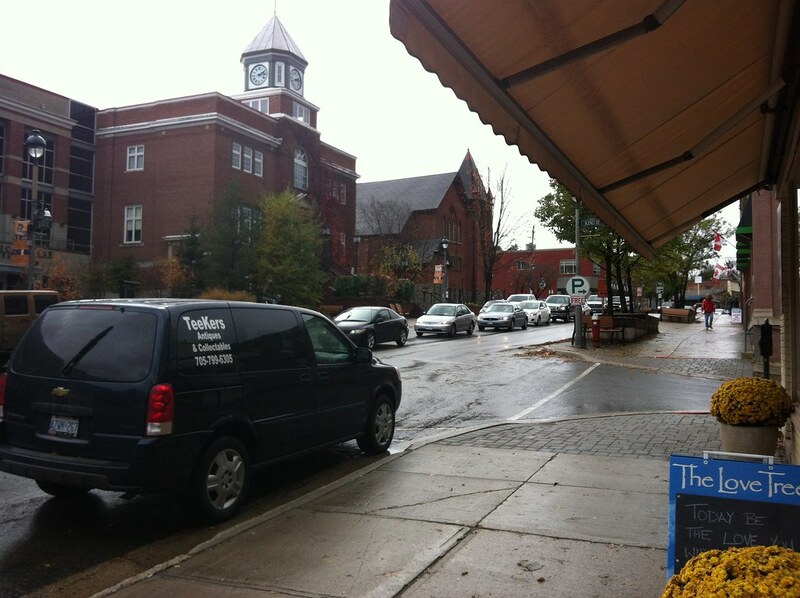 The weather turned sour north of Toronto, and we had a steady rain by the time we reached Gravenhurst. Despite the grey skies and the lateness of the season, the town here is beautiful, situated by a lake on Canadian shield. It’s rugged and hilly, and the trees still have a good portion of their colour. The downtown is extremely picturesque, and the bookstore was one of those lovely independents with a passionate owner behind the cash register, who still had a copy of Fathom Five, which I happily signed. Sitting in a Tim Hortons in Huntsville near the end of the season is good writing exercise. With the tourists gone, the locals are running the place and, as you can see from the exchange above, there’s no shortage of characters about. An elderly gentleman leans in as he tries to hear the lady behind the till struggle to parse his order. The lady later reveals to a regular customer that she’s adopted a beautiful 19-month-old. A man in overalls talks about how a cousin is dating the centre for the Ottawa Senators and that he may be coming to visit someday soon, and how stoked he is about getting the guy’s autograph. The town has a melancholy air, as it approaches what must be its fallow season. But there’s activity here, and interesting atmosphere. << In Preschool, Nora Takes Shop.